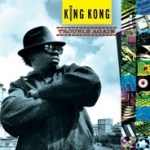 This release is King Kong’s classic `Trouble Again’ set, produced by Prince Jammy. Originally released in 1986 during the height of the digital explosion in Reggae and up until now has not been give the special release that it deserves. The albums contains hit after hit, such as ‘Legal’, `Mix Up’, `Follow Me’ and the HUGE title track `Trouble Again’. On top of the original ten album tracks, this release features three bonus tracks that appear for the first time on CD -`Move To The Top’ only previously on the `Superstar Hit Parade’ compilation album, and the cream on the cake is the highly sought-after track `Paro Them Paro’ a classic with the Jah Shaka Sound System, and the matching dub version - `Paranoia’ produced by Bubblers Computer Stars aka Patrick Donegan and Chris Cracknell.